The Adelphi Theatre Project: Graphics, Image for The Corps de Tambours. Graphics, Image for The Corps de Tambours. 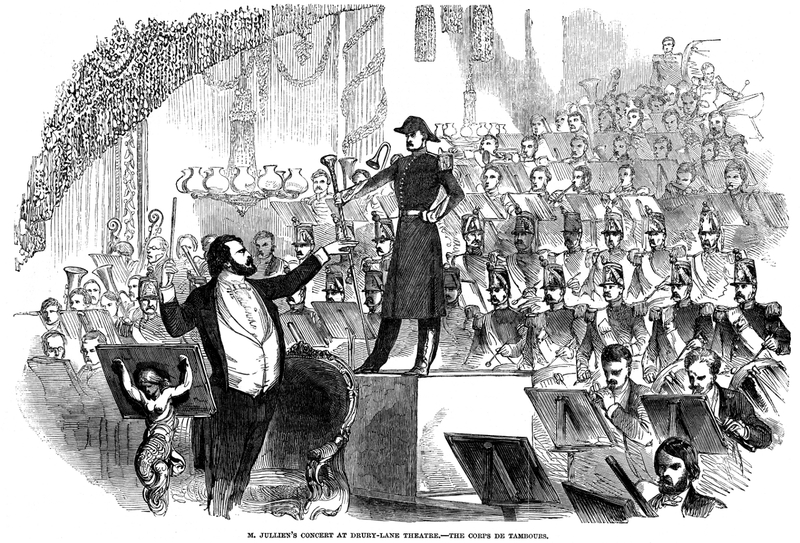 M. Jullien's Concert at Drury Lane Theatre.--The Corps de Tambours. The "Great Exhibition Quadrille," at Drury Lane Theatre has proved a great hit as everybody acquainted with M. Jullien's inventive faculties in such pièces de circonstance must have anticipated. In directing huge masses of executants from whom boisterous effects in broad contrast are to be extracted, in tickling the ears of the miscellaneous public by piquant reiteration of familiar tunes, in happy adaptation of passing events in musical description, M. Jullien has the greatest fertility of conception and facility of execution. Such compositions, or rather compilations, verging, as they are, on the burlesque, admit of no serious criticism. Every hearer--be he purist or gent-like--must be amused and even excited at times. Only conceive Jullien's ordinary orchestra extended and elevated to the very "flies," the rear filled with players in uniform from three military bands (the Royal Artillery, the Coldstream, and the 2nd Life Guards, with their respective masters, Messrs. Collins, Godfrey, and Grattan Cooke), the centre occupied by the drummers of the French National Guards with their Tambour Major, M. Barbier, perched with his golden stick on a raised platform beneath which is the "ruler of the elements," M. Jullien, on his golden throne, and the foreground filled with the stringed instruments! What a general is required to organize these formidable forces and what a concentration of the entente cordiale to see the French drummers fraternising with our red-coats. And the Tambour-Major, with his cocked hat placed rectangularly on his Gallic head, how fierce and yet courteous does he look! With what a graceful jerk does he come down on the concluding rolling chord of the drummers' "beat." And the "two sticks in waiting," at whose gyrations the executants so obediently play fortissimo or pianissimo--Jullien and Barbier, who, for the Exhibition of 1851, have really made a treaty offensive and defensive, and their united bátons of England and France marshal the orchestra with mighty vigour. Aladdin, who raised a palace in one night, by the aid of his wonderful lamp, and Mr. Paxton, who is raising a Crystal Palace, with his lamp of knowledge, are as nothing compared with Jullien, who dives into futurity and gives you the "March of All Nations to London." "The Great City," exclaims M. Jullien's combined orchestra, "which, for the first time, shelters such wonderful masses from all parts of the known world, is as yet tranquil" (at this portion of the quadrille the drums and brass are going in full force), "when at daybreak" (Kœnig's cornet) "the festival is ushered in by the sounding of the chimes of London" (played by Sig. Baldacci on the harmonicon), "echoed far and near from each surrounding belfry: soon the city's in movement” (the stringed instruments), "and the multitudes hasten towards the same goal" (Drury lane Theatre), "all eager to behold the most stupendous realisation of human industry recorded in the history of the globe. A tremendous shout bursts forth” (the entire orchestra shout hurrah), "and the welcomed nations" (M. Barbier and his 15 drummers), "one and all, join in the glorious cry 'God Save the Queen.'" After this, no wonder Jullien sinks exhausted in his chair of state, and the promenaders encore the anthem. M. Jullien, to suit the tastes of the various nations, has selected the Russian National Hymn, the Marseillaise, the Song of the Girondins ("Mourir pour la patrie") the Troubadour's air ("Partant pour la Syrie"), the military pas of the French (including Auber's "Pas Redoublé"), the Spanish "Zapatiedo," or clogdance of La Mancha; the "Cachucha" of Andalusia, the Sicilian Serenade, the Neapoleon "Tarantella," the Piedmontese "Monferina," "Rule Britannia," the "Row Polka," Carlotta Grisi's "Truandaise," &c., and all these materials, highly spiced, are served up in an exciting "potage à la Jullien." The enthusiasm of the audiences for this quadrille knows no bounds, and the theatre is nightly filled to overflow. The soloists deserve especial praise: M. Soualle performs on the "corno-musa," one of the new sax inventions, excellently; the tone partakes of the volume and richness of the clarionet and the bassoon. Pratten, Collinet, Delavigne, and Lazarus have the flute, flageolet, oboe, and clarionet variations. Baldacci, as the ringer of the bob-major, and as the castanet player, must be mentioned honourably. Lerey blows in the monster opheicleide, which makes itself heard; but the huge octo-basso, or colossal double-bass, is not audible as yet: perhaps we may be favoured with a duo between it and the gigantic drum. The Ciebras tinkle the guitar, and Streather strikes the harp. Sommer on the euphonican, and Cioffi on the trombone, display striking skill; and Kœnig is, of course, prominent amongst the obligato bits with his cornet. The drummers are especially noticed in their "roulement serré," pas acceleré, "chamade," chant d'honneur, &c.: their souls are evidently in arms, for their beat is full of crispness and precision. M. Jullien has appropriated "the all-absorbing subject of the day" most opportunely; his Quadrille will make a great noise for some time to come.